A paper in Immnunity has been retracted after two separate panels determined some of the figures “inappropriately presented” the data but cleared the team of wrongdoing. However, the original data are now unavailable, according to the notice, so there’s no way to know if the paper’s conclusions are sound. Having discovered discrepancies within the scatter plots in Figures 3B and 4B of this manuscript, the authors have had the data investigated by two independent panels convened by Queen’s University Belfast. The panels concluded that the data have been inappropriately presented but found no evidence of intentional misconduct. In addition, the original data are unavailable, and therefore the authors have decided to retract the paper. These figures showed altered M1-like and M2-like macrophage phenotypes in Socs3Lyz2cre andSocs2–/– mice after LPS-induced septic shock and the impact of the macrophages on regulatory T cell recruitment when they were adoptively transferred into Foxp3GFP mice. The authors stand by the validity of the other data within this paper and deeply regret any inconvenience caused by this retraction. In the version of this article originally published, the key for (G)–(I) in Figure 7 was mislabeled. The revised Figure 7 and legend appear here. The authors apologize for any confusion this error may have caused. WT, Socs3Lyz2cre, and Il6−/− x Socs3Lyz2cre mice were injected i.p. with 6 mg/kg ultrapure LPS, and survival was monitored over 60 hr. (A) Representative Kaplan-Meier plots after LPS challenge. 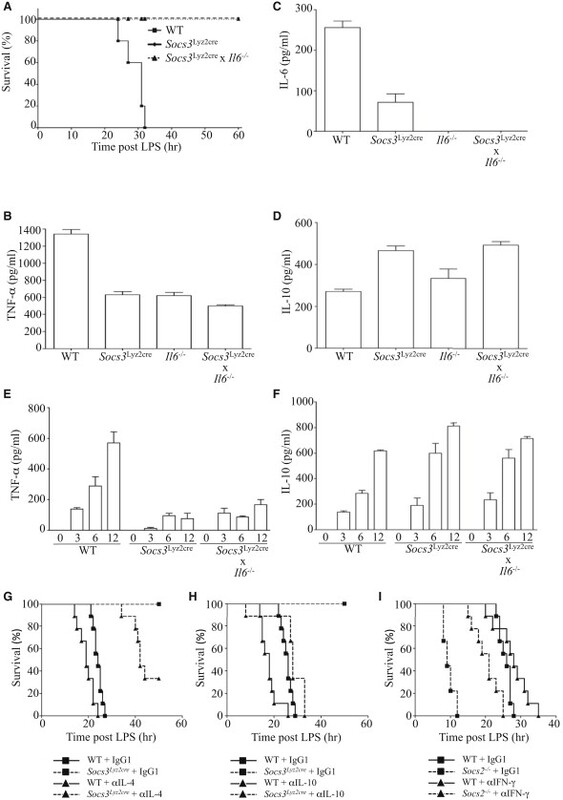 (B–D) TNF-α (B), IL-16 (C), and IL-10 (D) responses to 10 ng/ml LPS were measured in peritoneal macrophages in vitro by ELISA. Statistical significance was determined with two-way ANOVA and Bonferroni post hoc test (p ≤ 0.001). Data are represented as mean ± 1 SEM. (E and F) Serum cytokine TNF-α and IL-10 over time in response to lethal LPS measured by ELISA. (G–I) WT and Socs3Lyz2cre were injected i.p. with 0.25 mg/kg anti-IL-4 (clone 11B11) (G), 0.5 mg/kg anti-IL-10R (clone 1B1.3a) (H), or WT and Socs2−/− with 0.5 mg/kg anti-IFN-γ (clone R4-6A2) (I), 24 hr prior to receiving 6 mg/kg ultrapure LPS i.p. and after every subsequent 24 hr period. Survival was monitored over the course of 50 hr. Representative Kaplan-Meier plots after LPS challenge presented; statistical significance determined by log rank test. Data are representative of two independent experiments (nine mice per group). The paper has been cited 24 times, according to Thomson Scientific. We’ve contacted the author and the school and will update with any new information. I think that the authors were rash to retract. Perhaps a redaction would have been better in this case?